Bed Bugs Exterminator: We Can Get Rid of Bed Bugs for You! If you are wondering if you have a bedbug infestation, read our last blog to learn the signs to look out for. If you are certain that you have bedbugs, you may feel the only reasonable solution involves a gallon of gasoline and a match. While we understand the urge to just burn the whole house down, we have a better way, and it’s much safer too! We are Colorado Pest Management, and we use Integrated Pest Management (IPM) to get rid of many types of pests up and down the Front Range. Integrated Pest Management is a method of pest control that takes practical steps to control pests. We use toxic chemicals only when called for: never as a first resort. 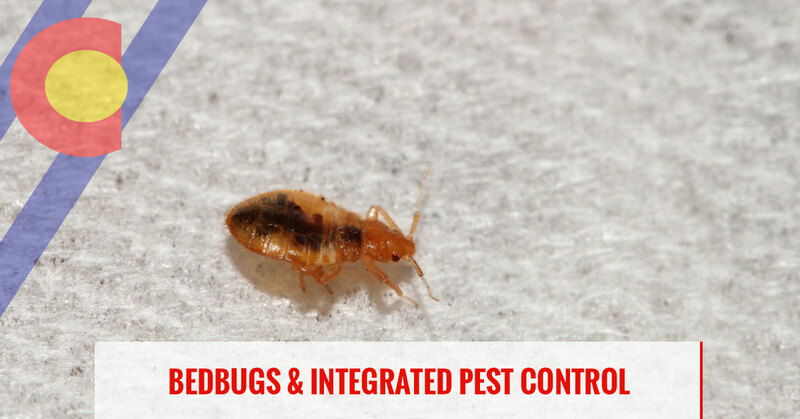 We have years of experience dealing with bed bugs, as we have been dealing with them since 1997. We have learned valuable lessons about how to eradicate these horrible pests from your home or business, all of which you can benefit from. If you need to get rid of bed bugs, call Colorado Pest Management. One of the biggest problems in the fight against bedbugs is that they have become resistant to many of the common pesticides that have been used to kill them. The pesticides, such as DDT that are effective in killing them are ones that are so strong that they are dangerous to people and the environment and so are banned from use. This is where the practical and logical practices of Integrated Pest Management can help. That following steps are common action items in an IPM plan to get rid of bed bugs. The first thing you’ll want to do is to wash all your bedding thoroughly. Wash your sheets, comforter, pillow cases and pillows on hot and then dry them on the highest, hottest setting. If your dryer has a sanitize setting, use it. Some people like to put some tea tree oil into the wash cycle as it is a natural pest repellant and its smell might give you some peace of mind. If you are able to freeze any items, you may choose to do this. 30 days in a deep freeze kills bed bugs. Using plastic covers on your box spring, mattress, and pillows is a temporary measure but one which will help pinpoint and contain the infestation. Break out the hose and vacuum every inch of your bedroom. Get all the cracks and crevices you can reach. Be sure to vacuum in drawers and at every joint in the nightstand and bed frame. When you are done vacuuming, throw the bad out immediately. Pull all your furniture 12-18 inches away from the wall, vacuum and when you put the furniture back, leave some space between the bedframe and the wall. If you are able to, you can try a steam machine to clean the mattress, but be careful to do this only when the mattress will be able to dry. You don’t want to promote mold. If you don’t need something on your bed or night stand put in an airtight bag. Take all your non-essentials on your nightstand and bag. Freeze anything you think bed bugs could hide in. It is tempting to try everything in the pest control aisle before you call professionals but you can actually make the problem worse by using over the counter pesticides. If you use weak pesticides, you may send bed bugs scurrying and make the problem more widespread and harder to combat. You should always use pesticides with caution when dealing with pests in your sleeping quarters. The last thing you want is long term health effects popping up in you, your family or pets from over exposure to highly toxic chemicals. Bedbugs can be extremely difficult to control and using a professional is a sure way to get the job done quickly and efficiently. IMP is a method of natural pest control that uses prevention, observation, and intervention to control the pest in question. We use practical methods and use toxic chemical only as a last resort and then only in required amounts. We take practical matters such as sealing cracks in walls and headboards to deny them shelter. After we have taken practical matters, we will monitor the status of the infestation with traps, such as under the legs of the beds. To learn more about how we deal safely and effectively with bed bugs, call us today and let us get rid of those bed bugs for you!